A summertime accident on Cold Storage Beach in Dennis left a frequent visitor seriously injured after a beach accident in Massachusetts. The beach’s strong winds took an umbrella right out of the sand and caused it to fly directly toward a man, striking him in his left eye, according to the Cape Cod Times. Lifeguards and a nearby physician rushed over to the man and provided him with first-air care. He was transported to Cape Cod Hospital in Hyannis and was later rushed to Massachusetts Eye and Ear in Boston for urgent eye surgery. It was there that doctors spent roughly five hours attempting to fix his ruptured eyeball. Unfortunately, the accident left his retina detached from the optic nerve. This is the nerve that connects the eye to the brain. Just a week later, doctors informed him that he would never be able to see out of his left eye again. Our Boston personal injury attorneys would like to give credit to the man’s wife who says that she holds no anger against the unidentified owners of that lethal umbrella and agree with her in saying that this accident could very well have been prevented. 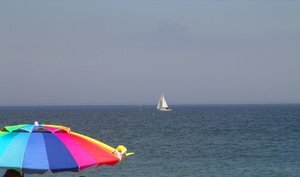 While it should be the responsibility of umbrella owners to properly secure their equipment in the sand, it is also the lifeguards and beach official’s responsibility to warn fellow beachgoers to shut their umbrellas on windy days and help to ensure that they’re properly set up in the sand. The town of Dennis has a policy in place to help prevent these types of accidents and was reportedly enforcing it at the time of the accident, but the wife of the victim claims she witnessed no such enforcement. According to beach statistics, about 6 accidents happen on Dennis beaches each summer with most accidents being less severe than this. Accidents on the beach are not uncommon. Beachgoers oftentimes will see and/or experience accidents involving boats, jet skis, umbrellas, parasailing injuries, drownings, lacerations from debris in the sand and all-terrain vehicle injuries. Many of these accidents can be prevented with the proper preventative safety measures. Rented umbrellas need to be properly secured by rental companies, jet skis need to meet all equipment rules and regulations, other beach rental companies need to be certified and trained in their operations and lifeguards need to be trained and alert when on the clock. It is critical for you to contact an attorney if you or a loved one has recently experienced a beach-related accident. An attorney can help you to determine who may be at fault whether it is a company, the designer of a product or another beachgoer. -First make sure that you choose a beach spot that will allow you and your buddies to have as much personal space as possible. Make sure you leave enough room to walk around and play. -Before placing your umbrella into the sand, measure and mark the umbrella at least 18 inches from the bottom of the pole, measuring up towards the canopy. -Put the umbrella into the sand and shift the pole back and forth while pushing down on it. -Continue doing this until the sand is up to that 18 mark you previously made. -Adjust the canopy of your umbrella so that the top is slanted towards the oncoming wind. This will help to prevent your umbrella from blowing away. We hope that everyone gets out there and enjoys the beautiful weather that the summer months provide, but remember to be safe and consider the safety of others as well when you’re out enjoying our public beaches. If you have been injured or someone you love has been injured or killed as a result of a Boston-area negligent condition, talking with an experienced attorney can help you better understand your rights. To schedule a free initial consultation, contact us online or call our offices at 1-877-617-5333.